The unsettled and explosive situation throughout the entire Middle East; the dominance of the Muslim Brotherhood in Egypt and its increased influence after the Arabellion, maybe soon as well, in Syria, radical forces in the Gaza Strip and in Lebanon; the increase in power and prestige of Iran - maybe soon armed with the first Mullah-A-bomb - and its allies Hamas – who could withstand Israel's overwhelming defense forces - and Hezbollah; the vote on November 29, 2012 enhancing the new UN status of Palestine to 'Observer State' passed with an overwhelming majority of 138 countries in the United Nations General Assembly. These show that the old peace strategies and concepts of Israel, the U.S., and the EU have all failed in this important region of the world. Israel's government under Binjamin Netanyahu and the Jerusalem planning authorities reacted in its well known bunker-mentality and in December 2012 announced new settlements with 2,612 homes in occupied Eastern Jerusalem and the West Bank. It includes Givat Hamatos, the first new discrete settlement since 1997, further impeding access between Jerusalem and Bethlehem, and Ramat Shlomo with 1,500 homes on the E1 land - two "game-changers" in the occupation policy. 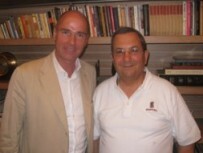 Dr Hubertus Hoffmann, President and Founder of the World Security Network Foundation, here in a meeting with Israeli Defence Minister Ehud Barak in Tel Aviv in 2008: "The plan of former Prime Minister Barak from the Camp David meetings in 2000 is still the best option for peace between Israel and Palestine. It included giving back up to 97% of the West Bank to the Palestinian Authority with a carve-out of a few Jewish settlements around Jerusalem, the withdrawal of most settlers from the West Bank, a territorial compensation in the Negev, financial compensation of Palestinian refugees from a special fund and joint security and water control." Israel, the U.S., the EU and the Western powers urgently need a credible, realistic, and promising New Peace Double Strategy. They should learn from the many mistakes and illusions of the past and follow a dual track of hawk and dove; a promising double approach of Uzi – the famous Israeli sub machine-gun - and olive branch, of deterrence and reconciliation. Palestine, as well, needs fresh approaches for peace and dignity, which must also include reconciliation. Despite current setbacks - the power gains of radical forces on both sides and many negative television images - viewed in a historical context, peace is possible between Jews and Arabs. The history of Europe proves this. Centuries-old ancestral animosities have been transformed into friendships, for example between Germany and its two largest neighbors France and Poland. At least with its neighbors Egypt and Jordan, Israel has already found a way to coexist. It had good relations with Turkey and has even improved relations with Saudi Arabia through cooperation. Real peace, however, must be "actively created", as so appropriately stated by Immanuel Kant. This wisdom is missing and forgotten. True peace requires common values and interests, and parallel political goals. It also needs a government-mandated, mutually desired reconciliation between peoples. Peace politics needs immense patience and daily efforts over many years. It must be able to withstand numerous setbacks and disappointments. Israel, Palestine and its Arab neighbors need to discover, promote and develop common values, interests, and goals in 2013. According to the principles of the UN charter and the values of the U.S., Europe, Israel, and progressive movements in the Middle East, common values in the Holy Land can only exist in universal, liberal democratic principles. This is the opposing model to the totalitarian beliefs of Hamas, the Hezbollah and the Iranian president. The common interests of Israel and its Arab neighbors - with the exception of Syria and Iran - is containment and neutralization of the Islamic totalitarian threat. This threat is life-threatening to all Arab governments and the silent majority of Western-oriented free populations, including important states like Lebanon, Egypt, Jordan, Saudi Arabia, and the prosperous Gulf States. Important common interests could also develop from expanded economic cooperation, above all between Israel, Palestine, and their neighbors Egypt, Jordan and Lebanon. Necessary to reduce regional youth unemployment, such cooperation may offer hope for a better future. One possible goal of a new Middle East peace politics could be the creation of an economically flourishing, free and prosperous "Free Trade Zone for the Holy Land" in association with the European Union. This would extend from Lebanon through Palestine; from Israel to Egypt and Jordan. The EU should begin concrete, intensive planning on this long-term goal and not wait until all border conflicts have been resolved. A new olive branch policy of reconciliation is a matter of survival for Israel, not the other way around. Israel's military response to Hamas rockets can only prevent attacks on Israeli territory for a limited time. It cannot bring about lasting true peace. Israel's policy toward its neighbors is lacking, and perhaps fatally so, the common element in successful peace politics: reconciliation. Israel needs, in the interests of its own survival, a new peace policy consisting of the "Uzi and Olive Branch": a credible double strategy of reconciliation on the one hand, and deterrence through both military operations against terror organizations and conventional and nuclear weapons on the other. The historical formula for Israel's survival, surrounded as it is by hostile countries and the threat of Iran-sponsored terrorism, is the "hawk plus dove". The hawk alone does not bring peace. In the next one hundred years, Israel will only be able to survive in its historic location, surrounded by a numerically superior enemy rich with petrodollars, when it places reconciliation with its Arab neighbors as "conditio sine qua non" of a genuine Israeli peace policy, and supports reconciliation with just as much energy, imagination, patience, and money as the necessary but insufficient military operations against terrorists. Israel needs a reconciliation offensive to supplement the necessary traditional military and power politics. Active power politics, be it the targeted killing of terrorists or the invasion of Lebanon or Gaza, only bring about a limited tactical advantage and not a lasting peace. Passive power politics by means of conventional or nuclear deterrents can only prevent the utilization of those same weapons by an enemy army. It cannot prevent the asymmetrical warfare of terrorists - the real threat to Israel. In Israel, the roots of this Olive Tree of Peace have long since been neglected due to understandable frustration, assassinations, and a bunker mentality influenced by Old Testament thinking ("eye for an eye, tooth for a tooth"). The Tribe of Israel's tree of peace has been dying slowly for many years. To this end, Israel can draw on European "best practice". There, millions of people were driven from their homelands following WWII, including twelve million Germans in the East, among them my own parents. They were peacefully integrated into their new country and made lasting peace in Europe possible through reconciliation and the renunciation of violence and a return home. The old fundamental belief, that the return by Israel of the occupied territories through a just treaty would result in a long-desired peace, has failed spectacularly. The release of the Gaza Strip - regrettably without the necessary and meaningful inclusion of positive reconciliation with the Palestinians - has not resulted in an increase in security, but has produced a vacuum filled by the radical Hamas. This step is both useless and counterproductive. It derives from the misguided planning and assumptions of the White House and the Israeli government under Sharon. Hamas and its supporters in Tehran are not just concerned with borders, but the total destruction of Israel and its power in the Middle East. Many millions of people throughout the Middle East sympathize with this goal. Israel is at a crossroads: Do they lose one friend after another - including the U.S. and many European countries - or start a new way of thinking, a new double strategy of power and reconciliation. Israel is in danger. The Israeli government is leading the people deeper and deeper along a dead end road of confrontation, promoting more and more hate on the side of the frustrated Palestinians. For too long Israel has been held hostage by both the nationalist wings in its politics, for example the Shas party, an ally of Prime Minister Netanyahu, and its traditional bunker mentality. In reality, Israel has no strategy but a pragmatic show of strength. It is about to lose the battle for its existence in the long-term. Israel is only focused on the hard factors of peace-making, like killing enemies and containment. New settlements in occupied territories are not in the security interests of Israel as they produce not peace but more hate. When in February 2010 the Israeli government included the grave of Abraham - Ibrahim to Arabs - in the Palestinian city of Hebron on the list of "Israeli national heritage sites" this was not only a clear violation of international law but also suicidal against Israeli national interests as it poisoned the weak tree of peace in the Holy Land. In Hebron the peace process is being hijacked by merely 600 Israeli settlers living in an enclave of 170,000 Palestinians, where violence has been inflicted by both sides for decades. This holy city should be a center of reconciliation and not hate. Israel and the world have to stop the radicals on both sides, and give peace a chance – now, in 2013. To date, Israel and the U.S. lack any promising double strategy of power and reconciliation, Uzi and the olive branch, hawk and dove. Only through such a double strategy was NATO able to neutralize the threat of the Warsaw Pact. NATO's strategy was spelled out in the 1967 Harmel Report: A dual approach of defensive capability and détente. Only through the NATO double track decision of 12 December 1979 could the nuclear threat to Western Europe by Russian SS-20 rockets be eliminated through an arms build-up consisting of Pershing II and Cruise missiles and the offer of an arms control agreement, the so called Zero-Option. These were spectacular winning strategies on the part of the West in Europe, towards an overwhelming threat. These strategies are also valid in the Middle East. The Uzi, or hawk, ensures that Israel is neither threatened by nuclear or conventional weapons and is able to at least constrain terrorism. These self-defense measures are not only necessary but also guaranteed by the UN Charter. Israel needs a strong military now as ever. As a hare waits for the snake, Israeli governments have waited so long for a "just" peace agreement between neighbors, above all with the Palestinians. This has seemed unachievable for decades. Worse still, the one-sided policy oriented toward the "Uzi" and the "Hawk" has brought more and more enemies with it and left behind the few who were understanding and sympathetic. As a result, it is the radical Israel-haters who have been strengthened, not the peacemakers. Israel needs desperately not only battle plans for wars but also battle plans for reconciliation. The well-being of the people in Gaza is in favor of that new peace strategy and not the opposite. Reconciliation for Gaza is needed as well. Now finally - late, but not too late - Israel must plant an olive tree for peace, tend to it and develop and implement a credible double strategy of the Uzi and the olive branch, hawk and dove. This must become the primary task of Israeli, American and European Middle Eastern policy today. Summits, high-level meetings, and conferences are necessary but are often self-deceiving mirages lacking long-lasting substance. This can be seen on hundreds of past occasions. They only make sense following a long term, successful implementation of a double strategy reaching the hearts and minds of the Palestinians and other Arab neighbors. Appointment of a new cabinet member responsible solely for the reconciliation policy of the Israeli government focused on the Palestinian Authority, Gaza and Lebanon. The position must come with its own staff and a large budget. Otherwise this important pillar will be buried, as now, in the standard procedures of other ministries. An annual report to Parliament by the government on the progress of reconciliation, as done in many countries on arms control and environmental protection. An Ombudsman of the Parliament collecting all complaints of Palestinians and others and attempts to resolve them. A release policy of Palestinian prisoners, who have no blood on their hands. This would be best combined with an official "let's turn enemies into friends now" campaign of the Israel government combined with an amnesty for crimes less serious than planning deadly attacks. Israel should finance a USD 5 billion "Israel Palestine Reconciliation Fund" which could finance the equipping of several hospitals, schools, and kindergartens in Palestinian areas with, for example, the financial support of Washington and Brussels. A USD 10 billion "Palestine Fund" which would compensate Palestinian families for the loss of their land. After fifty years, a similar structure has been set up by the German Government and German industry to compensate WWII slave workers, where more than 1.5m people received USD 7 billion within two years. Several Joint Action Committees in all major areas of politics with the Palestine Authority, including economic cooperation, customs, prisoner exchange, and internal prevention of suicide attacks. A freeze of new settlements for two years. Establishment of an Israel-Palestine Truth and Reconciliation Commission (TRC) as successfully set up in South Africa after the end of apartheid in 1995. The mandate of the commission was to bear witness to, record and in some cases grant amnesty to the perpetrators of crimes relating to human rights violations, reparation and rehabilitation, especially organizing suicide attacks and human rights violations against the Palestinians. Anybody who felt he had been a victim of violence could come forward and be heard at the TRC. Perpetrators of violence could also give testimony and request amnesty from prosecution. All conceivable humanitarian gestures should be realized in one wave starting with first actions in 2013. In other words, Israel should begin a reconciliation offensive on the level of the Yom Kippur offensive. It should strive to win over the hearts and the hopes of moderate Palestinians who have grown tired of murder and unemployment. Alongside the Camp David proposals of Ehud Barak, former Israeli Prime Minister and now both Defense Minister and leader of the Labor Party, Israel should develop an overall plan for a new ordering of its borders. Within this scheme, the centre of Jerusalem could be entrusted to the care of UNESCO as a world heritage site. The administration would be determined in a treaty between Israel and Palestine. The settlements in the West Bank should be reduced to a minimum and the border wall torn down after assassinations have substantially declined, maybe starting in 2016. The PA must stop its hate-propaganda versus Israel and develop a plan for reconciliation as well. Gaza and the West Bank need a Palestinian "Barack Obama" type of fresh politician who is credible, who has neither stolen money for his own bank account in Switzerland nor is focused on killing civilians but can give the Holy Land a Holy Plan for a better future now. His legitimacy must come out of a credible fresh campaign. Palestine needs a Third Force, a fresh young democratic party, which is neither the grey-haired bureaucrats of Fatah who lost credibility in past, nor the Hamas totalitarian bureaucrats with their narrow-minded black and white world view and no track record in human rights and a better economy or life. There are several Palestinians outside Palestine who would fit this job description and could do the patriotic job for their land and their people. We have to find them now and support their rapid rise to power, backed by the majority of now hopeless young people in Palestine. The slogan could be "Jobs, Freedom and Future for the People" - something Hamas cannot offer at all. To prepare the soil for such a new Palestinian leader and new democratic organization and election campaign you need time and a mood of the people to accept a positive image for their future, a choice between Katyusha and jobs, between al-Qassam missiles and kindergartens and schools. With such fresh double strategies on both sides peace is possible in the Holy Land - let's start it in 2013 and give peace a chance!